GOLD PRICE today lost $7.00 (yeah, sure) closing at $1,171.50 and SILVER lost 11.3 cents to $15.551. First, the GOLD/SILVER RATIO. It closed yesterday at 75.236, today at 75.333, a new high for the move. Good (don’t drop yore teeth, Granma! ), I say. 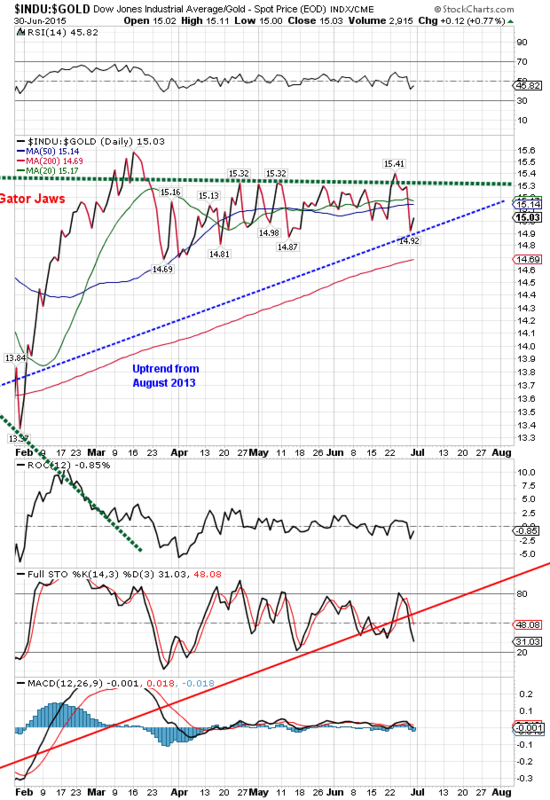 Ratio needs to top before silver and GOLD PRICES will turn. Remember that I expect the window for the seasonal silver and gold low will shut by 10 July or sooner. Don’t overlook that footnote. Since Sunday the price of gold has been steadily backing up, and was pressured again all day today. About 12:15 Eastern time it hit a low at $1,165.40, shot up to $1,180, but was forced back again. Lay aside for a moment all my comments about the Nice Government Men and just look at the chart. The gold price keeps on holding up around that $1,168 mark. WHY? Only one reason a market stops dropping: people start buying. I don’t know about the rest of the world, but we have been HOPPING. Customers I haven’t seen in years are coming back for another round with silver and gold, and new customers, too. Serious ones. Looking at support areas, there are previous lows at $1,162 and $1,141 and $1,130. Maybe on the announcement of whatever rat — whoa, sorry, make that “rabbit” — the Euros will pull out of their hat, gold spikes down. If so, I am guessing not further than $1,140, although it’s looking less and less like that will happen. Things don’t look much different for silver. This $15.50 area has been what I expect to hold, but it could spike to $15.00 or even $14.50. Probably tomorrow will tell the tale. Any good news for Greece and Europe will be bad news for safe haven gold and silver, so the maximum damage will come with that first blow. Watch closely. Without judging the justification or lack thereof for their suspicions, several people a day call me saying something like, “I just don’t trust the dollar, the market, the financial system.” Whatever the central banks have sown, distrust and fear are coming up. I bought some gold and silver today. If it drops tomorrow, I will buy more. We are right now watching the last lows for the year. But don’t take my word for it! I ain’t no mor’n a nat’ral born durned fool from Tennessee! But I know this: if the whole doldurned fynanshul system and almighty US dollar to boot go belly up, I can buy me a tin bill and peck in the dirt with the chickens and still make a livin’. Some other folks may go hungry, Lord have mercy on ’em. Please forgive me for missing a commentary yesterday. My out of town guests arrived before I could write it. Let’s catch up first. The Greek government shut down the banks, declaring a six day bank holiday, as well as capital controls. Greeks can withdraw in cash from ATMs only 60 euros a day, with a max of 1600 euros a month. Greeks may not send money out of the country without going through an official board (fat chance). Just to heap up the plate of Debt Gone Rancid, Puerto Rico announced yesterday it can’t pay its $72 billion debt and is days away from collapse. But markets didn’t do what you’d expect, not exactly. 4. No really nasty stampede out of stocks, but some trampling okay. Once you understand which stampedes you must stop, you know the manipulations you must make. With that in mind, let us ponder yesterday and today — philosophically, to keep down the tics and retching and fury. Against all odds the US dollar index, which overnight had shot up to 96.69, punching into overhead resistance, dropped 70 basis points (0.73%) to close at 94.95, well below its 20 DMA. Right. Sure. Of COURSE the US dollar index, safely-haven of scrofulous fiat currencies, would DROP on the day the euro threatens to come unglued. Sure, yeah, natural as a jet engine. Or it could have been a short squeeze in the euro. On the same day the Euro, flying apart like a Yugo at high speeds, still manages to rise 0.7% to $1.1246. Call me loony, I don’t believe it. And the price of gold, which had jumped up to $1,187 over the weekend, added only $5.60 to $1,178.50. Silver fell 7.1 cents to $15.664. Oh, yeah. Stocks were allowed some trampling. The Dow Industrials crashed through their 200 DMA (17,681) scraping off 350.33 (1.95%!) to 17,596.35. Whoops! That’s about 200 points lower than the Dow closed 2014. Yea, behold a low lower than any since April, below existing support, below water and taking on more at every seam. S&P lost more, 2.09%, to 2,057.64, but floated bare points above its 200 DMA (2,053.90). Y’all stop and chew on this a moment. The Greek crisis is only a CATALYST, not a cause for this plunge. Did no weakness beforehand exist, no market would plunge. Regardless how Greece is papered over, cascades, Niagaras, Iguaçus are coming in stocks, and soon. Today stocks traded in a tight range (138 points) and the Dow (or the NGM) managed to add 23.16 (0.13%) to 16,619.51, STILL below the 200 DMA. S&P500 added 5.47 (0.27%) to 2,063.11. Say, did I mention to y’all that the Shanghai Stock Exchange fell 3.3% yesterday? Or that it as of yesterday’s close it had fallen 21.5% since 12 June? I am so forgetful. Never mind European stock markets. 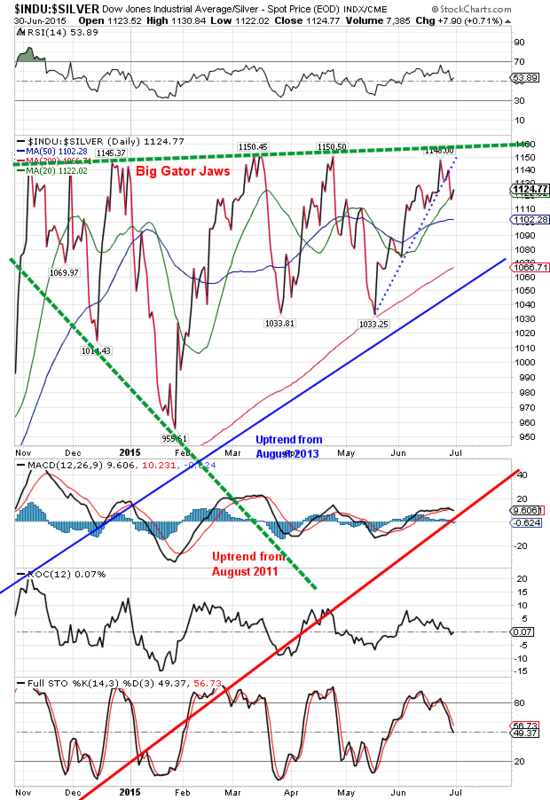 Both indicators are blowing the klaxon: ABANDON STOCKS! 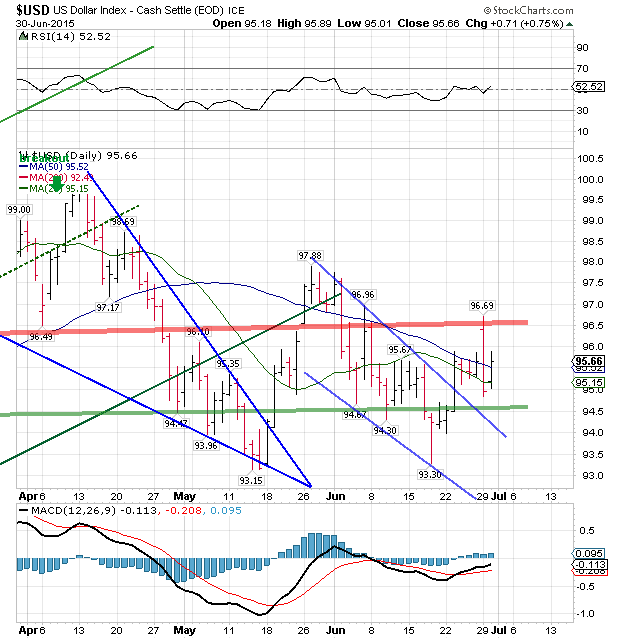 Today the US dollar index rose 71 basis points (0.75%) to 95.66, safely tamed from yesterday’s impulse to escape, and above both short term moving averages. If y’all want to see the Invisible Hand at work, chart on right. Euro lost 0.9% today to $1,1138. Ready to fall off the face of the earth. Yen jumped up today, gapped up yesterday, and has a little rally up out of that pit whereinto it had fallen. Closed up 0.07% at 81.65. US treasury yields remain high. 10 year treasury note fell below its 20 DMA yesterday, but made up much of that loss today. 30 year bond punched into its uptrend line yesterday, but came back a little today. Overall bonds have been falling and yields rising since 1 February. I hope Janet Yellen has stocked in a good supply of industrial strength anti-perspirant. Dad blast it, I disremembered something else! Anent Puerto Rico, do y’all think that’s the only governmental entity in the US with debt problems? Jefferson County Alabama (Birmingham) sank in the largest municipal bankruptcy in history, Detroit is in bankruptcy, Chicago is teetering, California (I will bet small money without looking) ain’t in great shape, and how many others are hiding in the woodwork? Don’t it just make you tingle with joy to know you are surrounded by such magnificent examples of financial management?